Greetings from Quito. Following is the official press release regarding the imminent shut down of the Pifo transmitter site. The end date for international broadcasts from Radio Station HCJB in Ecuador has been moved up as the missionary radio ministry defines new strategies for future outreach. Anticipating the opening of the new Quito airport near the station’s international transmitter site in Pifo, staff members have already dismantled all but 14 antennas and towers. 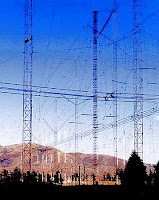 Present shortwave broadcasts in Portuguese, Spanish, German and indigenous languages, including Quichua, had earlier been announced to end no later than April 1, 2010. These international broadcasts will cease between September and November 2009. The Pifo closure will impact Radio Station HCJB’s Quichua Language Service with some programming moving from the shortwave frequencies to the local AM channel. Investigations are also being made regarding the possibility of transferring HCJB-2, the ministry’s 37-year-old FM station in Guayaquil (Ecuador’s largest city), into the hands of local partners. The mission’s newer strategy, begun in the 1990s, has been to reduce its emphasis on shortwave in Latin America while focusing on “radio planting” or assisting local ministries realize their dream of beginning a Christian radio ministry. More than 300 local stations have been helped in these endeavors worldwide, including about 60 in Latin America. HCJB Global also continues to expand its training ministries across the region. The appended message was received from Allen Graham, HCJB, Ecuador on August 12. HCJB Ecuador will end its shortwave transmissions from Pifo on September 30, 2009 except for one frequency in Portuguese which will continue until mid-November. We are awaiting the official Press Release which will have more details. The administrative decision was made due to a number of factors. I feel obliged to not say anything further until the official announcement is released. The future of the DX Partyline is still uncertain at this moment. When I know more, I will let you know. Thanks for all of your support over the years. We really need it now more than ever. Propagation news and a quiet sun !